Bows and Arrows for Boys, George C. Decker, 1930.—Accessories. Part 1 of 2. A few experimental shots will convince one that protection for the forearm on the bow hand is necessary. 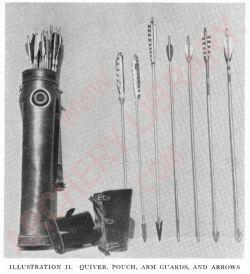 The bowstring slaps the arm and wrist with force, and it is necessary to have an arm guard there to avoid many black-and-blue spots. This arm guard is usually like a cowboy's leather cuff. (See Fig. 34.) It should be of light-weight, stiff leather, with a smooth finish. The cuff should fit snugly to the wrist and forearm, either laced or fastened with snaps, as shown in Figure 35. Another fact presents itself, and that is sore finger tips from releas­ing the bowstring. Even the most calloused fingers will soon develop blood blisters from continued shooting. 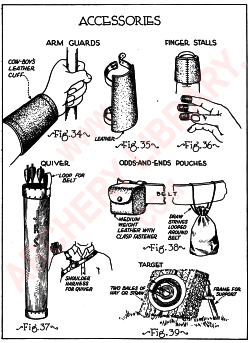 Archers use many types of finger protectors, known as "finger stalls." Usually they are little, and not too thick. These finger stalls are formed to fit over the tips of the first three fingers of the right hand, up to the first joint. (Fig. 36.) They should be made to fit tight, then soak them in warm water and force them into place. Remove them carefully and lay them away to dry. Once thus formed, the stalls will serve for some time. An old kid glove with light reenforce­ments on the first three fingers is suitable, provided the reenforcements are sewed on very smoothly.